This is my new website; which I was able to make thanks to all of your support. Please check it out and continue sharing posts you like. 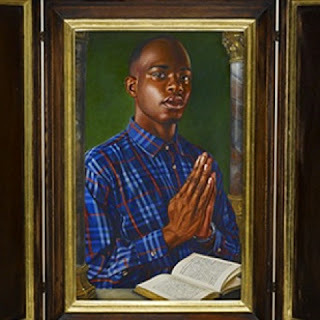 This blog has now moved to www.antoinespeaks.co.uk Please read the new and improved articles and stories. 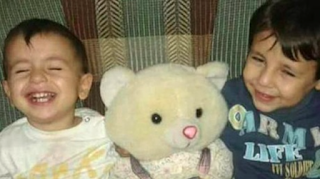 How many more images of dead children do people need to see, to be shocked in order to start caring about the refugee crisis? When do we say enough is enough? Actually, if you clicked on this post you most likely have already said enough is enough. You aren’t the problem. You do care. You have followed the increasingly desperate, saddening and shocking stories of these refugees or as I like to say fellow humans! But, you don’t share videos, images and news stories to preach to the choir. We need to share them to change the narrow minds of the Katie Hopkins, UKIPs, Britain Firsts, Fox News and Daily Mail commentators and followers of this world. 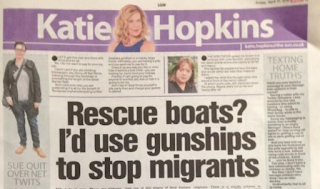 Those whom make statements like “send them back”, “throw them back into the sea”, "greedy for the good life in europe', “i'd should use gunships to stop migrants” & "cockroach migrants". When will they say enough is enough? So I ask you, if you still think “Britain is full”. What if it was you needing help? To save your life, what would you do to survive? What lengths would you take to live another day? How would you as a parent give your child a better chance in life? As you sit in your house, at work or school. Your life seemingly ticking over at the pace you have grown used to. Sometimes, you have your highs and sometimes your lows. However, your lows are never really that low and your highs are so in abundance that you devalue them to just being normality. The normality of your child's laughter and smile greating you home after another day 9-5 day. So, sometimes you complain about the boredom of Mondays. You half-heartedly, celebrate the freedom that Friday brings. You complain to yourself when the bus being late is the main cause of disdain for your day. Sometimes, those politicians we give our sovereignty to seem to be doing an ok job; they say they are “protecting the national interests”. Other days, you don’t quite like what those politicians are saying; but you get back to living your own life. Back to occasionally complaining about those minor annoyances and undervaluing those many securities and joys. You continue on this path until, one day all of that security is ripped away from you. There are no more buses to take you anywhere. Those whom either loved that politician or hated him are fighting a bloody war; with you stuck and lost in the middle. The security you thought was a given is dramatically taken away. Now each day is a continual battle to survive. What if in the mix of this survival you have the added responsibility of trying to secure your children’s future. The sound of the gunfire is overshadowed by their tears, screams and pleading for food, water and an escape from the fear of death. But, all you know is your homeland, where your father raised you, where his father raised him. A place where you speak the language, you know the people and most of all, a place you call home. 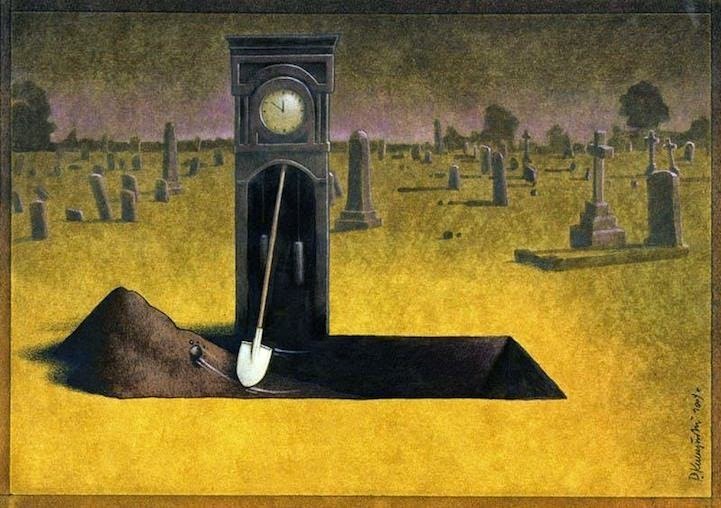 But, how can you stay in a home that has lingering hand of death knocking on your door each day? How can you keep stop your child’s tears and give them a brighter future? So, you leave. But leaving isn’t emigrating. You can’t sell your house, car or possession. Who is going to buy a house in a war zone? You scrape together what little money you have and hand it over to someone who exploits your need for freedom, safety and a brighter future. You tell your child that you are going on a new adventure to somewhere they will be safe. As you sit crammed into a make shift boat, your mind starts to weigh the risk of staying versus the uncertainty of going. Going to a land where the people accuse you of ‘looking for a free ride’. A land where people say “send them back”. Without really thinking where back is. Back is sending someone to potential death. And, If you do make it, you would have made it where others had perished. Even then you may find yourself left for dead in an overheating Van crammed with people. Can you now imagine the lengths you would go to survive and live another day? 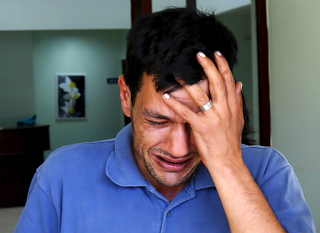 Can you now open your heart to someone who doesn’t look, sound or come from the same nation as you? Can you recognize them as another human? Another human in desperate need of your concern at the very least. What is living in peace? For most of us it is having somewhere we can call home. Having family, friends and security around us to let us know this is where we belong. Are these not shared values. Shared values that are universal in all societies. No one wishes for their homeland to become a place of civil unrest, war and death. This little boy is one of many. 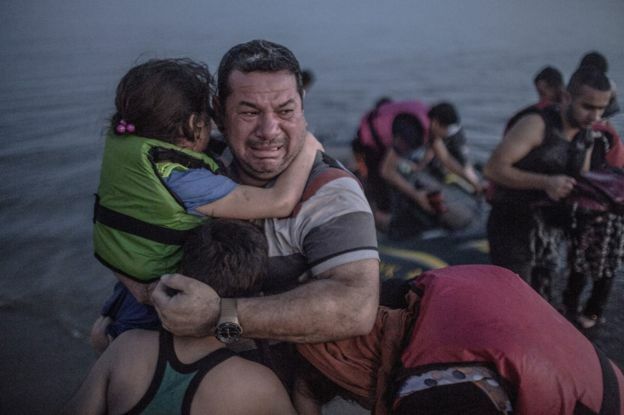 One of many boys, girls, women and men around the world, whom will die trying to escape death. There will be those who do make it. However, what life will they lead after that? Some will scorn them for trying to simply live another day without the cloud of war thundering over their children’s and their own heads. Yes, it is a big world and one country can’t help everyone. However, this isn’t an issue for one country; it is a global crisis. Each person must look at themselves and their government and ask “What are we doing to help?”. If Britain took 25k that would only be 40 people were constituency! As I have said previously when stating “African lives don't matter”. I say again that only by standing together can we stop this decent into a world, whereby Extremist attacks become more frequent, Wars become more common place, Apathy becomes the norm and we struggle to recognize the humanity in our brothers and sisters. I don’t want to live in a world that becomes more marginalized and narrow-minded because we don’t speak out. 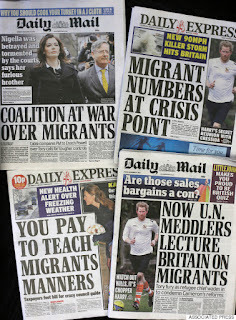 The papers exploit tragedy for profit and readership. They help to build up the anti-migrant, refugee and the scary foreigner narrative. They don't tell you how migrants boost economies and are essential to keeping public services running. 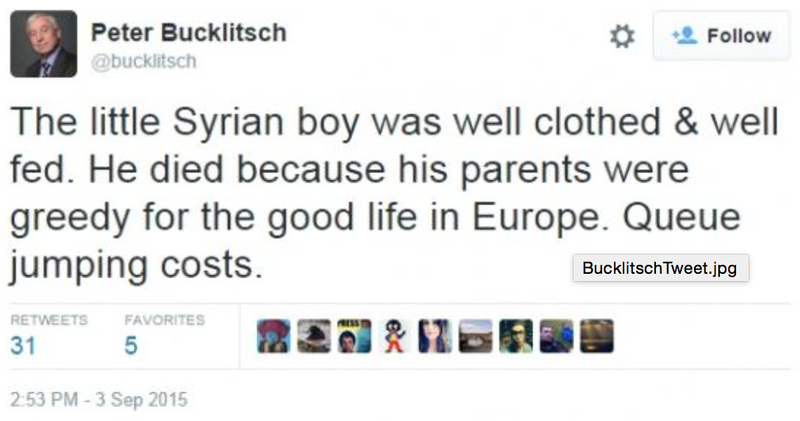 They don't tell you about how history teaches us that ignoring refugee crises only leads to far worst problems. 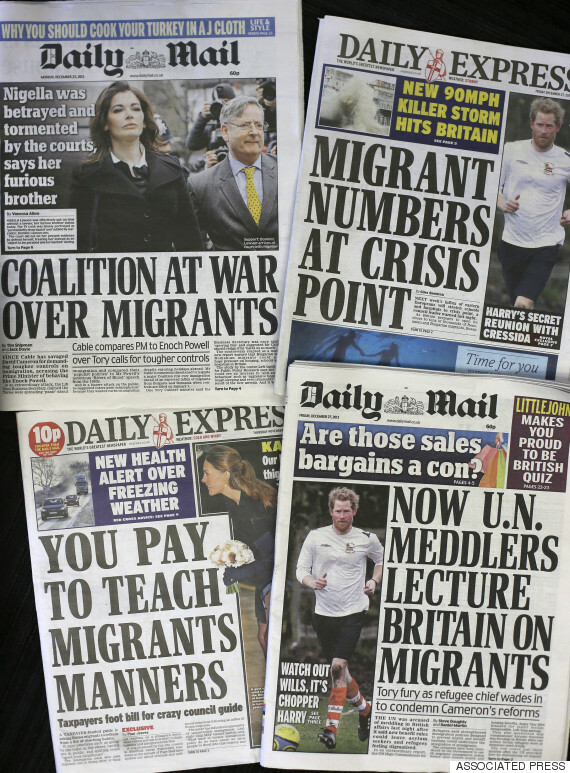 Papers make profit from hate and fear! Don't be fooled by temporary concern. Yet, even if they pretend to care for a while. Let us not let this story die. Let us not let these people’s lives die in vein. Let say no more; I won’t stand by and allow apathy and disrespect to be the commanding voice of my nation! I care and so should you! Remember this, Katie Hopkins, Ukip, Britain First or any other ignorant and/or Racist group/icon is only as strong as their followers. If you can persuade someone to stop supporting them; then their power of influence will diminish! 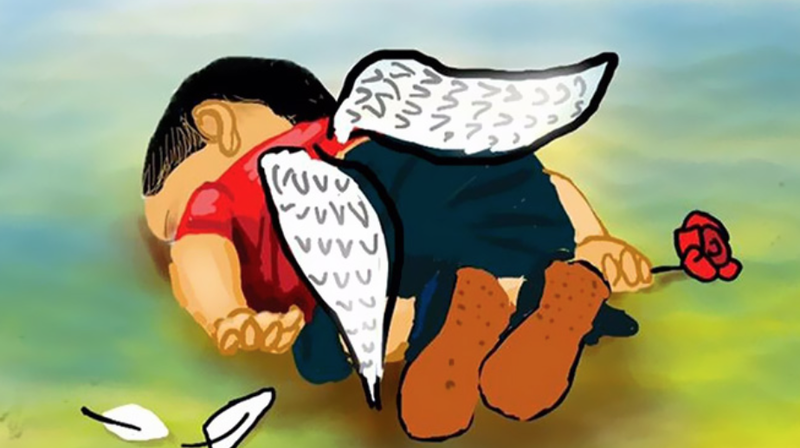 For these children, I offer the poem in the video below: Kids who die by Langston Hughes. Let this little boy be symbolic of how we will not bury our heads in the sand and allow this crisis to be silenced. Is your government doing enough? If you found this post thought provoking, please read my other relevant posts. Most People Won't Share this... because African Lives Don't matter! What is men were treated like women? Most people won't read or share this; don't let this massacre of Students distract you from videos of cats and posts from ladbible... Such is the wasted potential of humanity, since the advent of social media. Before you read or watch; please note I wrote this blog post in April 2015. 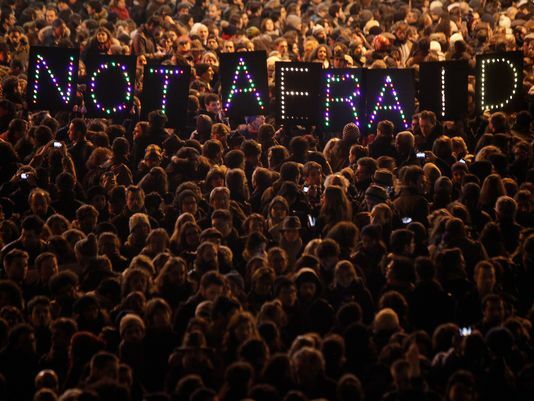 However, after the recent Paris attacks and many other attacks I have since wrote this(click the link to read): "I will not let terrorist make me afraid and nor should you"
You are welcome to read both blog posts; Thank you. Click above and you can now watch me reading and explaining this blog/the title; or carry on reading on for yourself. 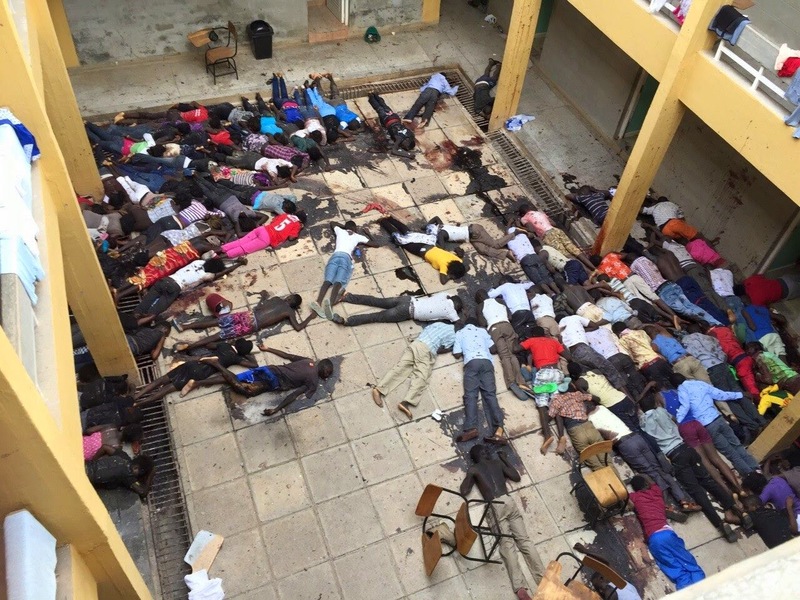 This Week in Kenya, a Massacre of 148 students took place. 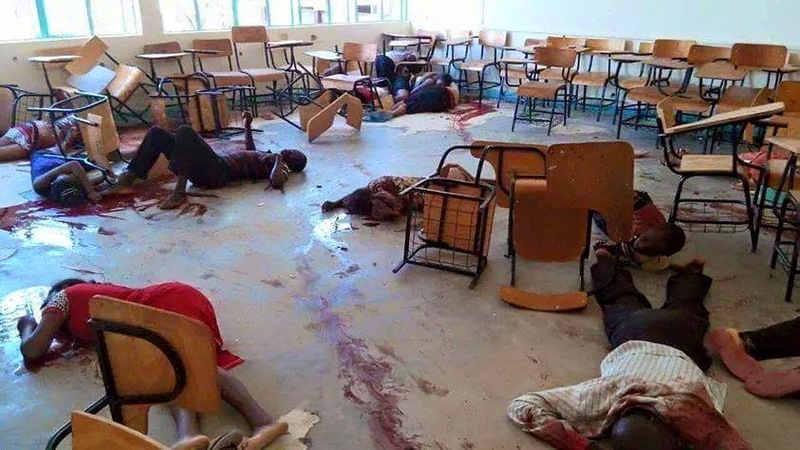 Students murdered by four armed Terrorists of al-Shaabab. Some were able to survive, leaving us with harrowing stories. Ones such as a man whom smeared blood on himself and hid amongst the bodies of his dead and dying friends. Or others like the woman who hid terrified in cupboard for two days; so scared to come out, that her rescues had to desperately convince her she was safe. The question becomes; what is surviving and what is safe? 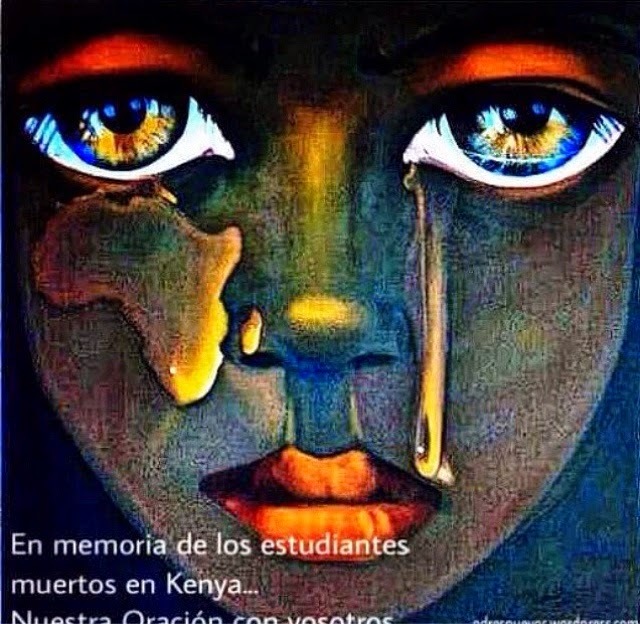 These students will have to live on with these terrible memories and experiences. Expectedly, their university remains closed indefinitely. Their future hangs desperately in the balance. Most sadly, they will have to live on in fear each day in a country where Al-Shaabab's militants remain at large and continue their threats of mass-violence. Spare a moment for the 148 whom did not survive. The clothes of their families will be no less soaked in tears. The screams of their sorrows will echo around the streets, churches, mosques, homes and fields of a their country with no less anguish. Yet, the world does what to combat, acknowledge, condole or seek retribution for their murders? There will be no Foreign leaders photo opportunity or Je suis... hashtag. 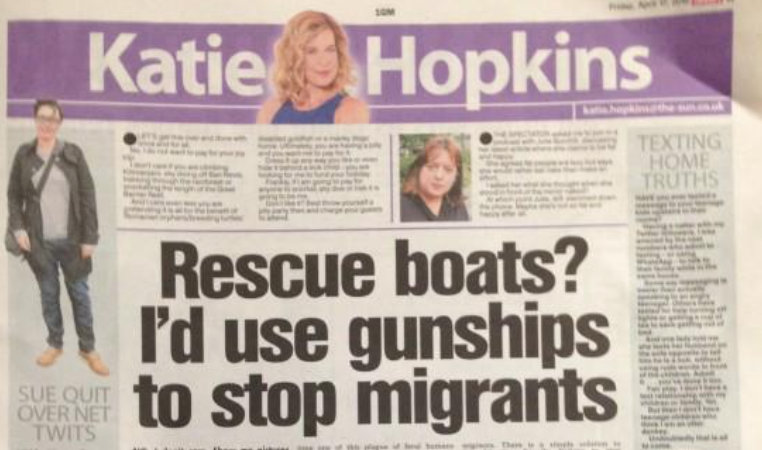 Most newspapers won't run their tragic deaths on any front page. Why? A quick look at Zizek on Violence can explain our western mindset to non-western deaths and/or violence. "Over the last decade, 4 million people died in the Democratic Republic of Congo - mostly political killings. 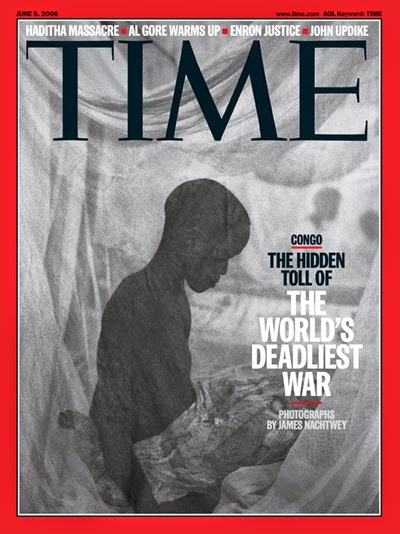 Time magazine ran a cover story in 2006, titled "The Deadliest War in the World," chronicling this state of affairs. Replace 9/11 with the tragic deaths of the Charlie Hedbo staff and we are in the same situation. 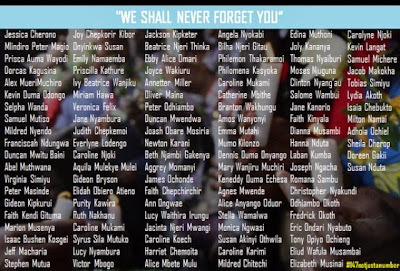 We ask the world to weep for our loss or a loss close to us, without showing the same sadness or respect to their losses. Or worse, the thousands of lives we have had a hand in creating; from the estimated 1.2million(at least) that have died due to the so called War on Terror. Antoine you're wrong! "I do care; i wrote that status about the Charlie Hedbo Attack..."
Well, at the same time as 12 people died in France, there were 12 other terrorist attacks around the world. The most horrific was 2000 or more that died in Nigeria at the hands of Boko Haram. Where was their Je suis hashtags, protests, headlines, posters, vigils, status or tweets. 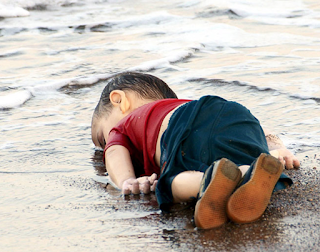 I say, in 2015 we need to think more as a united humanity rather than 'them and us'. We need to see their deaths as our deaths. Their lives as our lives. We need to move further together instead of drifting further apart. We are socially connected but more disconnected; this banality of violence must stop. Check your own timeline; when was the last time you shared something of meaning, positivity or educational. Check your mind; when was the last time you read a story about someone who didn't look like you, live in your country or wasn't 'famous'? When was the last time you sat and read a news story from start to finish? When was the last time you thought "i won't let this story be forgotten between the posts about cats and selfies"? When was the the last time you thought someone needs to read this; "The world needs to read, see and act on this"? A long time? this is because of the Banality of violence. Whereby we choose between whose deaths we care about and whose we don't. Whose lives are worth protesting, weeping and commiserating. There is a buffet of media; we would rather digest the sweet pointless posts and videos, than the news stories and tragedy that leaves a lump in our throat. A friend asked me why this was the case and why this wasn't major news on all media forms; to use a popular phrase why this hadn't broke the internet? Well, it could be because they are Black, could be because they are far away or even simply because the media has created a narrative about Africa. 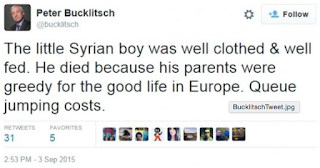 That narrative is a place that is uneducated, uncivilised and a conflict zone. Not a place of development, growth, innovation and full of people with hopes, dreams and aspirations just like anywhere else. This media driven narrative means people read stories about Africa and think "that's ok, that happens there all the time". This gives people an excuse not to emphasise. Not to care. Not to share. Not to write that status, tweet or share that post. "Africa and violence is old news". Do these lives not matter? Are we that busy sharing rubbish that we can't take a moment to care for these students? Look around you, read the news, read your own timeline of friends and you will see we are divided and we are falling. Realistically, we can not change the foreign policy mistakes of the past. However, we can change our personal social and humanitarian thoughts and actions for the unity of today to influence the future of tomorrow. Only by standing together can we stop this descent into a world, whereby Extremist attacks become more frequent; in a world that becomes more marginalized and narrow minded. A world whereby, we still elect people who do not care or represent our lives. A world whereby, we allow ourselves to be distract by fake realities and celebrate infamy rather than talent. A world whereby, the gap between rich and poor grows each year. A world whereby, a "like" is valued more than real tangible protests, thought provoking, debate, discussion, actions and change! I don't have the answers, but if we think together, we act together. WE CAN COME UP WITH A BETTER ANSWER THAN THE MINORITY THAT KEEP FAILING US AND THE WORLD! Here are two poems that are poignant in these troubled times. I often suggest to people that they should read this poem, when someone passes away who is close to them. I think it is still fitting for this tragedy. RIP to the many that will sadly befall a similar fate. RIP to those who have already befallen such a tragic fate. Share this post and see if the people you know share it or like it; you will see exactly what i am talking about. Most people will skip past this and watch a funny video instead. Which isn't your fault. At least you tried to be "The change you want to see". 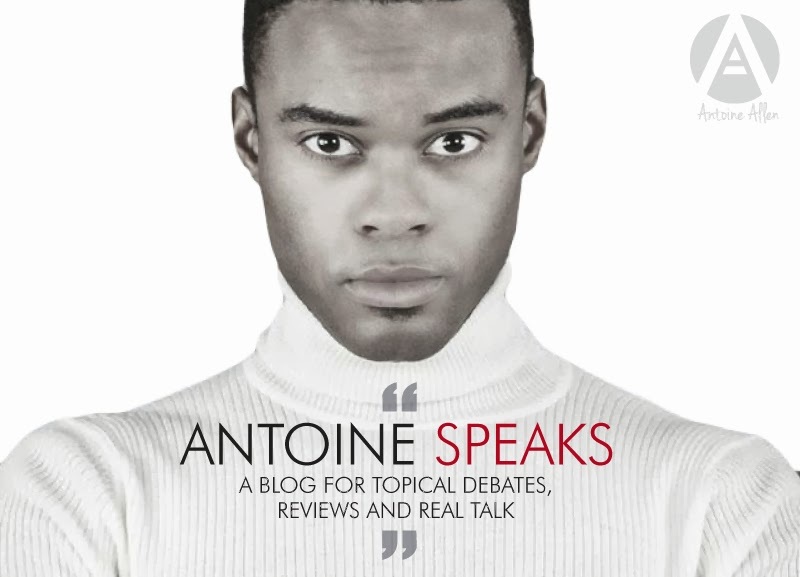 Please follow my blog, youtube, Facebook and/or @AntoineSpeaksOn twitter. Below are some of the generic questions i have had since writing this post. Do I have to share this blog? No, but share something. Share something of support, something of substance, something that inspires, something that challenges people to do something, care and emphasise. Most of all share your own opinion. I am just one person; just like yourself. My opinion is no better than anyone else's. As an Arab saying goes "The same rain water, grows weeds as well as roses; but the rain remains the same" Most of you reacted 'positively'. Others not so much. Such is life. Should I stop having fun on the internet/social media? No, of course not. The internet is a gift. A gift filled with fun, interesting, funny, cute and amazing videos/posts/sites/thoughts. However between the fun stuff, simply take a minute to care. It doesn't have to be every day; but when the time comes. When a story is so bad that the world must react. REACT don't be apathetic, distant and disinterested. Antoine, saying "Most People" is generalisation; Why don't you feel it devalues your post? "All generalisations are false; but this to is a generalisation" Someone far smarter than myself said that. If you clicked on the blog you aren't most people. However, if your only reaction to the blog is the title. Not Kenyan deaths, not the world ignoring Congo, not the world picking which deaths matter, not society becoming increasingly distracted by rubbish, not the media driven narrative that Africa is only a place of violence and not the call for you to change either your ways or attempt to inspire the people you know to change theirs. Then you have wasted your time reading this blog. The Title is a call to action. Simple as that. Message me and i will explain the nature of the internet in 2015. Sometimes you have to challenge people to think i.e. The greater good. What if men were treated like women? To Pimp a Butterfly By Kendrick Lamar Signals the Return of Real HipHop Finally! Kendrick Lamar’s to Pimp a Butterfly signaled the return of revolutionary, real talk, issue led, lyrical, provocative, spirited, meaningful, thoughtful, self-critical, black and proud Hip Hop. ""The three three c's of life; choice, chance and change. You have to make the choice, to take the chance, if you want anything to change"
In these troublesome times, we find ourselves once again marching against persecution, fighting for freedom and having to force society to allow us fair representation and acceptance. If Kanye West thinks he is a Musical Genius then his Wife is a Marketing Genius. Think about it? During ‘The Fappening’, celebrity women’s bodies were snatched up on social media faster than when a child throws a completed deck of Pokemon cards in the air in a school playground and shouts “Scramble,”; frantically, immaturely and with little regard for who gets hurt in the process. "The three 3 c's of life; choice, chance and change. You have to make the choice, to take the chance, if you want anything to change"
Most annoying question people who don't work in a office get asked! Why don't you have a "proper" job? What is a job? You could simple say it's something that earns you an income i.e. money. However, some people give more weight to some jobs over others. Deeming some professions as not being "proper". Leading people to judge you. Leading people to underestimate your intelligence. Which can often lead you to doubt your path, your dream and yourself! A Politician could say well i run the country. A Lawyer could say well i keep you in check. A Doctor could say well i keep you both healthy. A architect could say well i designed the building we are having this debate in. A Builder could say well i brought those designs to life. A Policeman could say well i protect all of you and this building. A Journalist could say well i told the people about this meeting and all of you. An Actor could say well i entertained you when you finished work. A teacher could then say well i taught every single one of you. In the end our jobs have a synergy, where each enables the other. Where each fulfils a need or a want in human society. We all have a role to play. 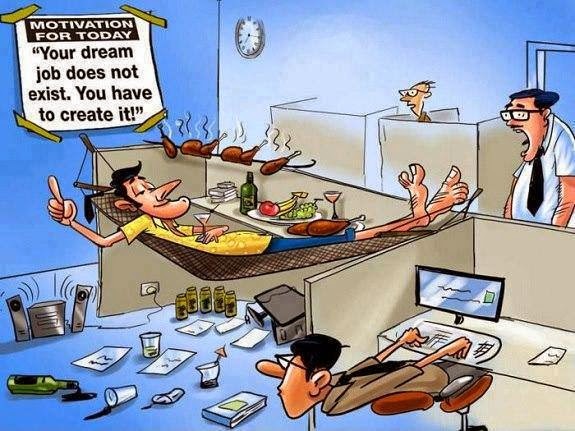 To us the life of creative and non-officer/9 to 5 workers is one of ups and downs. Its sitting next to the phone, email and Laptop waiting for that casting, audition, play, booking, shoot, film role, press launch, etc etc. Society judges us by titles and superficial things. Often people see pictures and assume/Stereotypes about you. Most of us are more than just our job. Most of us are more than just our level of education. But people assume because you don't wear a suit everyday or work in an office that you don't lead a "proper" job or you lack intelligence. Yet a lot of the most intelligent, opinionated and eloquent people I have known never set foot in a university or don't own a suit/ nice dress. Some careers follow unconventional pathways of chasing an aspiration whilst trying to survive. 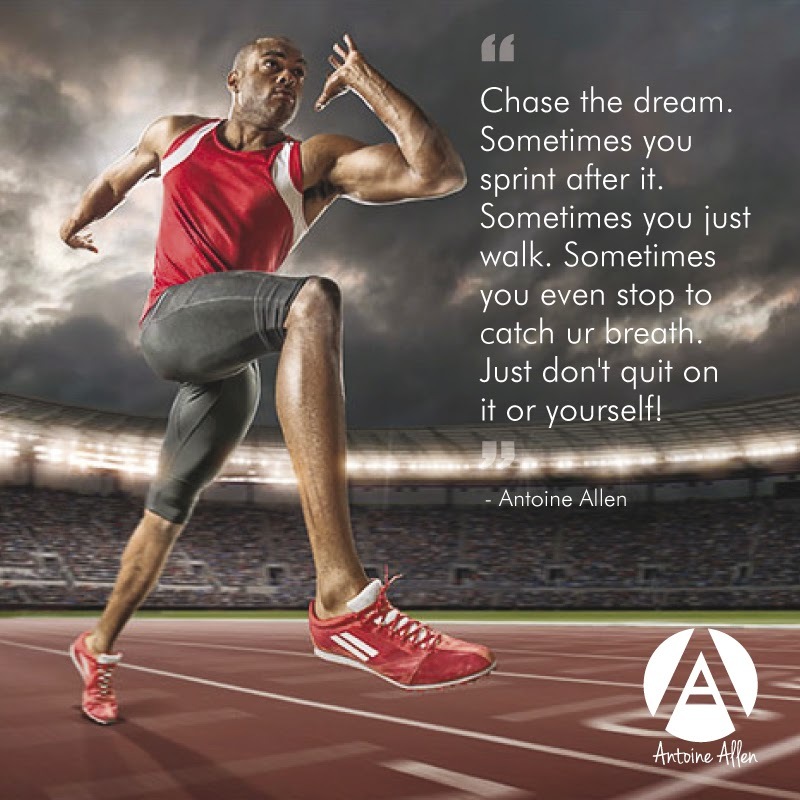 This leads you to do the odd job that often is not your dream but enables you to keep pursuing your dreams. Whereas, some people lead lives where they are simply happy; they don't have expensive cars or money to waste spraying alcohol on each other but they do go home each day satisfied. Whereas others work in jobs they dislike but it provides them with the income to do the things that make them happy or buy the things that do. Finally, some people's dreams are achieved before others; they work in a job they love. 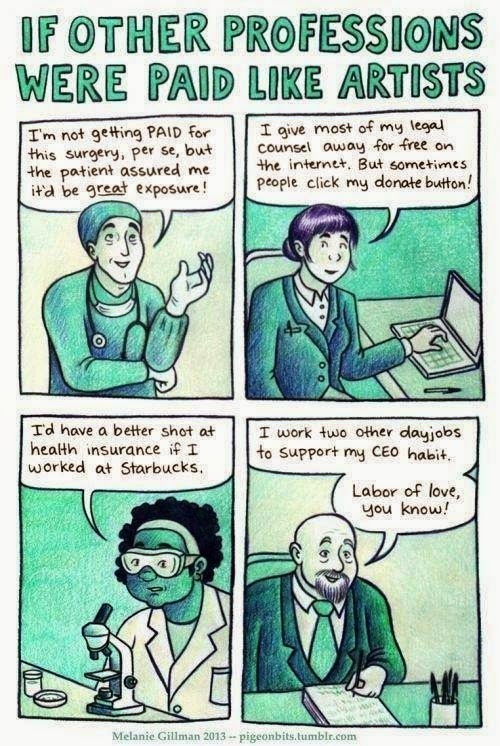 Plus, the pay enables them to also buy/do the things they love. They are a minority in the work place! They say "do what you love and you will never work a day in your life"; however, most people don't get a chance to do what they love. 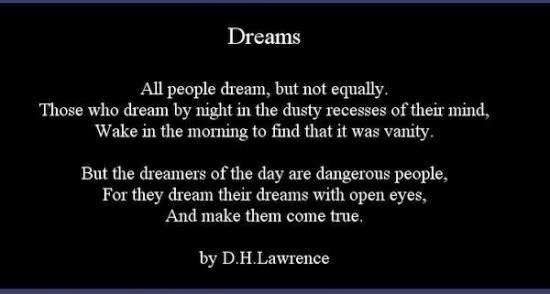 Yet, it doesn't stop people from pursing those dreams and hope to do what they love one day! This is the nature of man; "horses for courses". We each do what best suits us. What best fits our worldview, hopes, dreams, commitments and confidence. It's a non linear employment; self-employment, Self drive, Self improvement and Self belief. It doesn't follow the 9-5 monotony of regular employment. It doesn't follow the i hate Mondays routine. The waiting for the weekend routine. 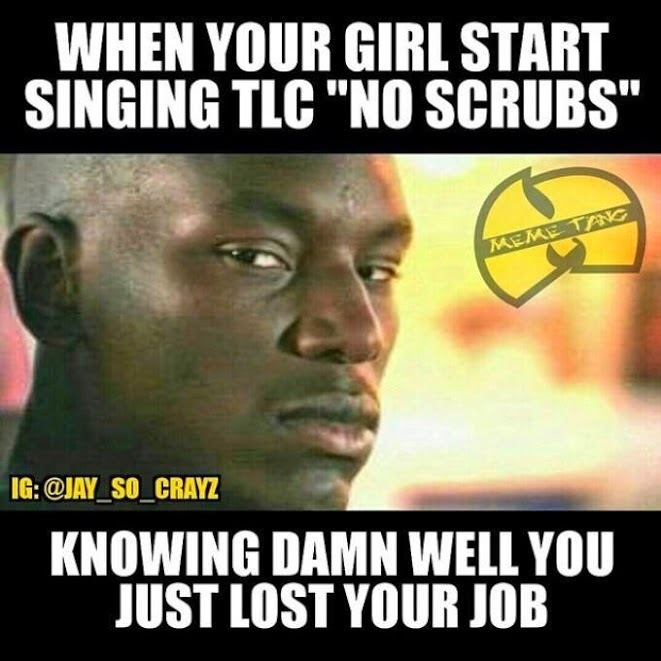 Or the " i hate my job because in my heart i know i gave up my dreams to play it safe" routine. It is the the last reason that is the provocation for the judgment. People who have achieved their dreams straight away or have given up on them often lack the empathy for those still living or chasing their dreams. They don't understand that to land that big job of consistent employment, you have to survive whilst waiting. So yeah, sometimes they may see you on the street handing out leaflets, samples or dancing in an unknown artists music video. They forget these bills aren't going to pay themselves. They forget that we much like them still have responsibilities and obligation. We are just the same as them; trying to survive and be happy. 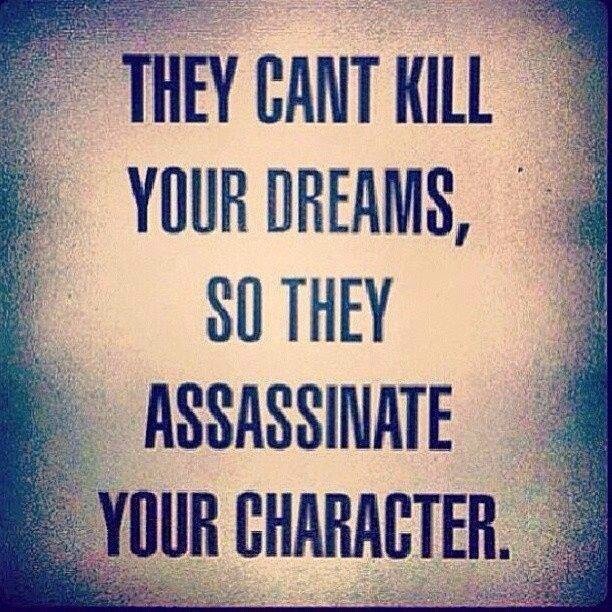 Except our survival is to enable us to keep chasing that dream. Keep applying ourselves every minute of everyday to "making it". So we can write that Facebook status or tweet "Finally landed, booked or got signed for the.... ". I say what happens to those people if they lose their job? If they tie their self worth so tightly to their profession? Do they cease to be a "proper" and "worthy" person if they unemployed? Or is it as i believe, that we are more than the way we make money. We are more than the title on our CV. Or in my opinion all jobs would be unworthy when compared to those who teach our children(education professionals) or help us when we are sick(medical professionals). So let us start valuing the dream, the ambition and the courage of people. Dreams and ambition come in many forms; some are complex and lofty. Some are simply having a home, family that loves you and enough money in your pocket to survive and then some. Courage can be pursuing that dream to reach the mountain top. Courage can also be excepting that you have to put your family over personal ambition or glory; not settling but accepting your role as the hero of your own household. We all make courageous decision in what we do in life. Let us respect each other's journey. For the dreams and the believers; keep chasing those dreams. Sometimes you reach your destiny in record time. Most of the time you hit speed bumps along the way. You trip, you fall but it is up to you to get up and continue. Don't let temporary defeat knock your confidence in everlasting glory. Don't let a lack of support make you forget that your own spine, your own legs and your own mind are strong enough to carry you to your goals. You have the power to turn dreams into reality; be patient, be dedicated and keep believing! afraid to respect the individual"
So, What's your opinion? is your job worthy? are other people's jobs less worthy? What is your dream? As usually feel free to comment below. All discussion is welcome!